June 23 - August 15, 2019| $380* + Airfare! 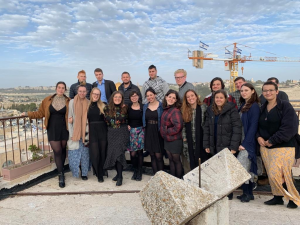 Price includes 6 weeks of intensive ulpan*, full accommodation (apartments) in the Old City of Jerusalem, food stipend, and transportation pass. Way More Ulpan is an all intensive 8 week program with 6 weeks dedicated to boosting your conversational Hebrew skills. Not only that, but you can put your newly acquired skills to use while living in the Old City of Jerusalem. Come volunteer with us! Help our fellow brethren with various opportunities such as working with children with special needs, volunteering to help bring joy to retirement homes, helping students from low SES backgrounds, and much more! *Ask about how to get the Ulpan accredited. 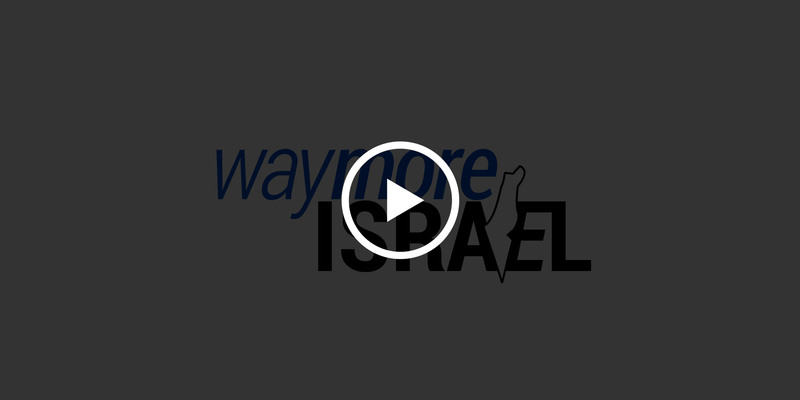 This program is in partnership with Onward Israel. Apply now and ask how to get the scholarship. Aside from honing your skills you have the possibility to get college credit for the classes. Inquire more on how to do this. 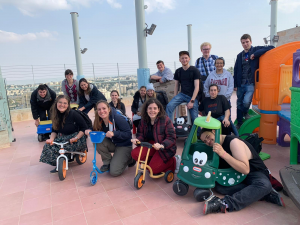 While the Ulpan classes will give you the skills to speak conversational Hebrew, the best learning experience is not inside the classroom, but outside. If you want to get a good grasp on the Hebrew language, you need to take your newly acquired skills, go out, and put them into practice. How many hours of Ulpan will there be? Ulpan will be 3 hours a day for the first 9 days, with the following 6 weeks having 5 – 6 hours a day of Ulpan. What level will the Ulpan be at? The number of tracks will depend on the number of participants who sign up for Way More Ulpan. How much Hebrew will I be learning? The following 6 weeks, will be a more intensive Ulpan program with 5-6 hours a day with the goal to increase your confidence in speaking with true Israelis. We do not send a staff member to meet you at the airport. There are a few options you can take, Many people like to take a shared mini bus which can be found just outside the airport. It fills up with 10-15 people and drops everyone off where they are going around Jerusalem. This takes a little longer until you arrive, however it is a cheaper method of traveling. Another option is a private taxi, which will bring you here straight, however it is a bit more costly. Several weeks before arrival, you will pay a $250 security deposit, refundable at the end of the program if no damage is incurred to Way More Israel’s property and if there were no attendance or disciplinary problems. Way More Israel provides a stipend to cover groceries. At your discretion, you can supplement this with your own money. Way More Israel’s summer session is already heavily subsidized. To help cover airfare or other costs, you can ask our staff about contacting the Israel program department of your local Jewish Federation or other organizations that provide scholarships. Don’t forget to check your passport. Passports must be valid; if your passport expires 6 months before your travel date, you will not be allowed to board the airplane. You don’t need a student visa if you are staying for under 90 days. When should I book my air ticket for Way More Israel? This is entirely up to you. Prices fluctuate based on season and demand. Flights with a stopover in Europe tend to be cheaper. WMI takes no responsibility for travel to and from the program. What kind of volunteer projects are there? What is included in the dormitories? The dormitories are fully furnished with beds, table and chairs, heat/air-conditioning, washing machine, wifi and a tea/coffee station. Blankets, pillows, linens and towels are provided by Way More Israel. Way More Israel participants live either in dormitory apartments or a youth hostel in Jerusalem’s Old City. There are 2-4 people per room. The beds are single beds as well as bunk beds. Is it safe to be in Israel and/or Jerusalem these days? Jerusalem in general and the Old City in particular has increased its level of security. Way More Israel has your safety in mind and works in conjunction with National Security to make sure all trips are safe and security-cleared. Our staff is knowledgeable and will help you decide where to go during your free time, if you ask them. You’ll have plenty of time to explore Jerusalem as a local – the shops, the restaurants, the museums, and cultural exhibitions. Being in the Old City opens up a world of new sights and sounds to discover. Way More Israel is a project of Onward Israel, part of the Jewish Federation of Israel. They subsidize the trip based on certain criteria and for most participants the cost is $380 (not including airfare). If you are not eligibile for the scholarship, the cost is $5800. Please note that the $380 payment for the program in not refundable for any reason. Jewish people ages 19 to 27. You need to speak English fluently and have no physical or mental limitations that would prevent you from the getting the maximum out of the program. Participants usually spend $400-600 per month for food, local travel and personal expenses. Cellphone rental and travel outside of Jerusalem could increase your costs. This is only a guideline and some participants will spend more or less. Bring your ATM card with you – it’s the quickest and easiest way to get cash! WHAT ARE YOU WAITING FOR? APPLY NOW! SPOTS ARE VERY LIMITED!